As July in Philadelphia goes, this has been a hot one. The city where freedom was born (sorry, Paris) has seen its share of hot summers, though, including the one in 1787 when the nation’s structure was formalized. Attendee William Paterson of New Jersey called the city that summer “the warmest place I have ever been in,” ending his otherwise insightful sentence in a preposition for some reason. The heat is also on the region’s top flight soccer team this summer, the Union. 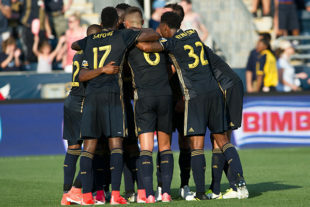 Sitting 17th in the 22-team Major League Soccer table, Philadelphia Union still have a reasonable chance of making the bloated MLS Cup playoffs. In seasons past, this would have been (U.S. Open Cups notwithstanding) the organization’s only focus: find a way to eek into the final playoff spot and appease an ever-restless fan base for a few more months. However, things have changed in American soccer. There would be promotion and relegation in the entire American soccer pyramid, starting immediately. Freedom from the tyranny of the single entity structure was born. Six thousand white doves were simultaneously released into the cerulean and amber sky that morning, a collective gasp could be heard from every corner of the American soccer landscape, and the dawn of a new era had commenced. A unanimous vote by owners of every team in every division was perhaps the most shocking development for those that have questioned the individual business merits of such a structure, but the decision was made. According to the word that descended from that patriotic mount, the American soccer pyramid would remain intact, with Major League Soccer staying the first division, the NASL staying as the second, and the USL remaining the third (with several other leagues, including the PDL and NPSL making up a semi-professional fourth tier). What would change, however, is the competitive chance to move between leagues on merit. Each division would now have a two-plus-one system for promotion and relegation, named the Decree for Open divisioNs: General American Reorganization for the Betterment of soccER, or DONGARBER. The way DONGARBER would work would be by automatically qualifying the bottom or top two clubs of any division to their respective promotion or relegation and having the third best or worst team play a two-legged playoff against its opposite team in the related division: winner up, loser down. Understandably, the ripple effects of DONGARBER are immense. However, immediate implementation requires analysis and — given these revelations — it’s worth looking at where the local Boys in Blue stand as of today. As mentioned above, the Union sit in 17th with 23 points. Below them are LA Galaxy on 22, New England on 20, Colorado and Minnesota* on 19, and D.C. United on 18. Philadelphia is just three points above the drop zone with the toughest schedule in the first division left. Uninspired performances, like the one in Montreal on Wednesday (wherein Player of the Game, Interesting Man of the World, and semi-professional Dashiell Robert Parr impersonator, Fafa Picault, was chided by his teammates both for not scoring a goal and then for actually scoring a goal), will certainly not be enough to stave off relegation or a spot in those parachute playoffs. Relegation has made the Union’s season interesting again. Thank goodness for Gulati’s DONGARBER. Meanwhile, vying for automatic promotion spots are several ambitious NASL clubs. Spring season winners Miami FC have already booked their excelsior ascension, bringing “Ray Gaddis Award for Quality Professional Sporting Human” winner Michael Lahoud, with them, as well as tactical genius and World Cup winner Alessandro Nesta and their club from The Magic City (No, the one that doesn’t have David Beckham) straight to prime time. The fall season will determine the second automatic qualifier, and the smart money is on the San Francisco Deltas or New York Cosmos to make the leap too. With names like Deltas and Cosmos, though, fans of all teams should be hoping for a triple promotion. The intrigue in American soccer has never been higher, and thanks to Gulati’s DONGARBER proclamation and the ever-bubbling stream of optimism that hath flown from it, supporters from every corner of this great nation can now truly dream of first division glory. Author’s note: This is obviously a work of nonsensical fiction, and I’m sorry that I’m not sorry that “Bad Romance” is stuck in your head right now. Would “Garber Gate” have been too much? Alternate realities make one sad. Chris, onto you I bequeath all the gold I have ever earned doing _New York Times_ crossword puzzles. Thank you taking my Patreon dollars, and transmogrifying them into original soccer joy. What a glorious reality this would make.